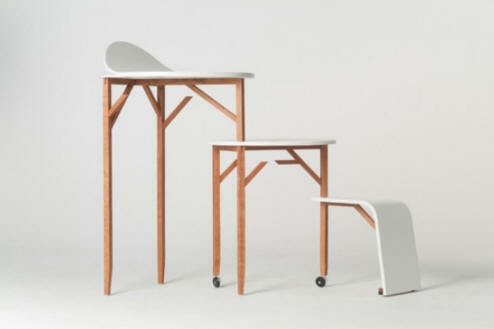 Portable office furniture with a minimalist design and elegant style that is very interesting, quiet beauty of the colors using a combination of natural wood furniture assembled into office by Anna and Isabelle Lohn is called Woody. Portable Office aims to create a comfortable working atmosphere, you can use the pieces as a chair, table or for extra storage. It’s kind of forest to work and it’s up to you to decide what way to use it. Form of fine curly white and a touch of minimalist color, some pieces have wheels to make transportation and easy position changes. This is a great place to work transformable for those who like to change the space and discover new functions.